In all my comings and goings I seem to have finally settled in a little one-room cabin in a snowy oak forest in Southern Oregon where I cook on the woodstove, sleep in a tiny loft and do not have electricity. The snow, I am told, is an anomaly; but for now it is beautiful and in the evenings the moon makes it glitter through the big glass windows and I sit by thrift-store candlelight, reading, my poison-oak vector of a little dog curled on my lap and the woodstove making its fantastic whooshing noise. The door of the woodstove does not fit properly and so there is no way to damp it; the fire is either whooshing fantastically or out entirely. My cabin, as a consequence, is either freezing or very, very warm but I oscillate happily between the two, coming and going stamping snow off my shoes hauling glass jugs of water from the main house on the other side of the oak forest, where I also go to use the internet and to write. There are ornery goats here, multitudes of chickens, ducks, several sprawling buildings, wood that needs harvested, bucked, transported and split, crops that need processing, fussy systems that freeze and break, all of the little things that make up a spilling-over land project that has no edges or foreseeable shape. I am the caretaker and I have my little cabin and there is time to work on my book and here I am in the forest, in this transitional zone between the wet and the dry, short Siskiyou Mountains rolling away and that is good enough for me, for now. And if I wanted to I could walk to the PCT from these 64 acres; just twenty-ish miles by trail. And that is very soothing. I am looking forward to being here for the holidays, which are hard for me. I do not have parents or any semblance of a relationship with my extended family; I have a brother, who I love, but who lives far away, and that is all. Holidays make me think of family and although I have chosen family they usually are off visiting their families and I often end up feeling sort of lost, thinking of my mother and watching whole seasons of television shows by myself, in a dark mood. You’d think there’d be other orphans like myself but apparently we’re a bit of a rare breed- in spite of everything, almost everyone has at least a little bit of family. But this year I’ll be here, on these snowy, oak-covered hills, shoveling logs into the woodstove and making a pot roast, maybe, or some sort of gluten-free loaf, and there might even be friends visiting, and we can pretend it’s not christmas at all but some other, magical time, at the end of a real whirlwind of a year. And that, I think, will make it better. 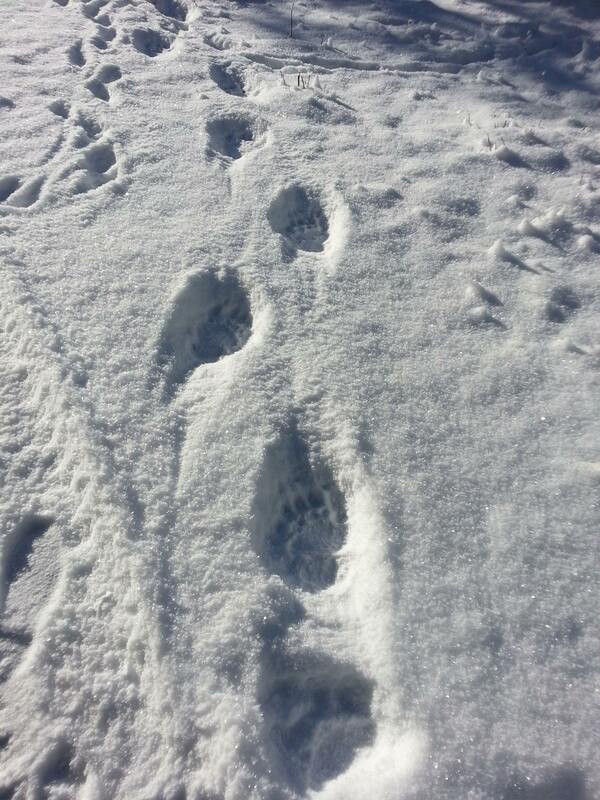 Awesome thing: two days ago there were black bear tracks in the snow! The bear passed right below my cabin. Where was it going, and what is it even eating this time of year? Update: the giant Toshiba laptop I’ve been typing on since 2008 is on its way out. The power cord must be plugged just-so into the machine and if I bump it even a little the computer dies. (It just died while I was typing this; I just had to restart it.) The battery doesn’t hold a charge and the computer crashes at least every other time I start it up. I am very attached to this computer but it appears that things do not last forever. People lately have been emailing me saying that they get a lot out of my blog and asking what they can do to support my writing; I’ve created an amazon wishlist for my life in the snowy oak forest that includes a rechargeable LED lamp, a pair of realtree muck boots, and a macbook pro, just to be ridiculous. (There is also a non-mac computer; I love non-mac computers and they are much more reasonable.) All of these things (especially the chocolate flavored tortilla chips) support my life in this snowy oak forest in my tiny, off-grid cabin and by extension, my book. Time to tromp down to the barn in the snow and give the goats their hay. Today we walked them along the trails above the road and they gnawed at the blackberry brambles, which is their superpower. They are nice and barrel-chested and they wish only to eat the madrone; to eat ALL of the madrone. More PCT posts soon, later tonight in fact. Washington is exciting, yes? I can relate to your family situation, or lack thereof. For me: no parents, siblings, or cousins; single with one son in Portland; a handful of good friends; and a wonderful pet African Grey parrot that sometimes talks to me. I’m a (rv’er) snowbird in Tucson. Past holidays have been lonely with all the media promoting family gatherings. I have accepted this arrangement and am finding more enjoyment as time moves on. Whether it’s good or bad stuff, I recall a phrase “this, too, will pass”, and it always does. I do my best to make “the present” my friend, too. PCT2014 is calling; let’s see if I can answer it in person. Hey Carrot~ I wanted to send you something from you wishlist (the candle), but when I went to complete the order, it said it was shipping to me. Weird. So I didn’t do it. Is there something I’m doing wrong, or do you need to put in your address? Not sure how it works. Didn’t you used to have a donate button? Let me know…either way, I’d like to send you something. Your journey has just been so incredible, and I have loved living vicariously all these months! Update to my last comment: It was easier to send a gift card to your email, so that’s what I did. But for the wishlist, I think you need to configure something so that the items automatically ship to you (with your address hidden, of course). Good luck, and Cheers! Dave- PCT 2014! Doooooo it!!! DogsDon’t- I fixed the wish list. Thanks for the heads up! And thank you for the gift card!!! Have you googled “Do bears eat goats?” ? Thank you for the tweet about Sarah Marquis! I’m going to vote for her every day…i think that it’s really good that the Mongolian horsemen don’t follow her on twitter. 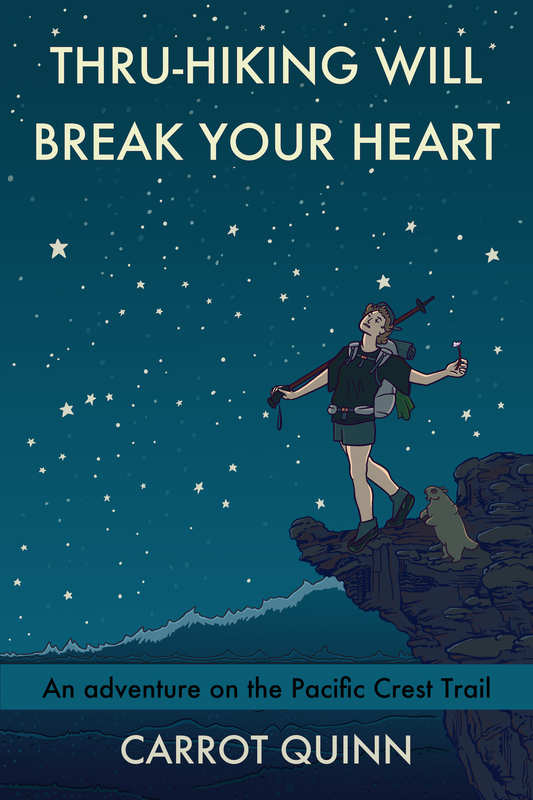 So, Sarah and you are both holed up in cabins on different continents writing a book about your hikes/walks….If i have to make a choice, i’ll buy your book first! “wood that needs harvested, bucked, transported and split” Are you from Pittsburgh?? Well, no, I guess I know you’re not. But you’re speaking yinzer!